Quick specializes in arranging for urgent deliveries of aircraft parts, pharmaceuticals and other goods requiring strict temperature and security controls and has been owned by TJC for less than two years. The company, based in Jamaica, N.Y., generates annual net revenue of more than $200 million, according to a statement released by Kuehne + Nagel on Nov. 21. Terms of the deal, which is subject to government clearances and certain closing conditions, were not disclosed. The Jordan Co. acquired Quick in March 2017 and later that year purchased Unitrans International Corp. from Roadrunner Transportation Systems and acquired a majority stake in Odyssey Logistics & Technology Corp. In 2018, TJC acquired Phoenix-based freight brokerage and logistics firm GlobalTranz Enterprises. • Quick Healthcare handles transport of personalized medicine, cell gene and immunotherapy, cord blood, organs and tissue for transplant, blood products, bone marrow and medical devices. • QuickSTAT transports specimens for clinical research, investigational drugs and clinical trial supplies. • Sterling Aviation provides delivery of critical parts for manufacturers and aircraft maintenance and repair operations. • Quick Logistics provides project management and secure chain-of-custody deliveries for high-tech firms, financial institutions, and media and entertainment firms. In August, Kuehne + Nagel acquired the perishables business of Panatlantic Logistics SA in Quito, Ecuador, a move that company officials said will boost food exports to the United States, Europe and Asia-Pacific regions. 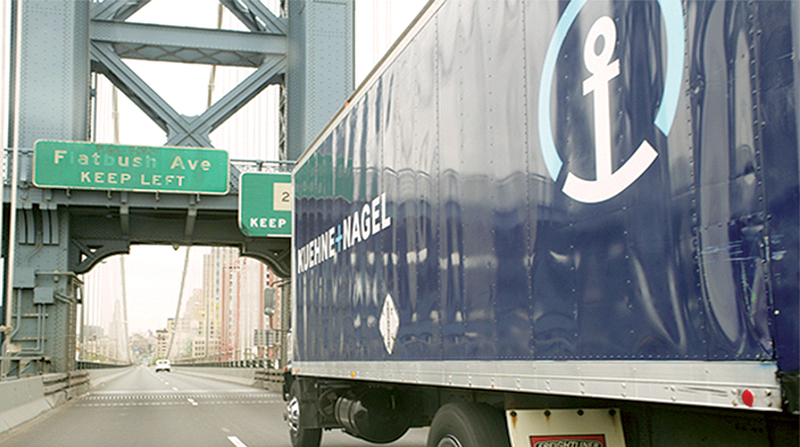 “Perishables logistics is a strong growth driver for Kuehne + Nagel,” Ruud said in a statement. In 2017, the company acquired Los Angeles-based Commodity Forwarders Inc. and African produce distributor Trillvane Ltd., based in Kenya. “After the integration of two market leaders in 2017, the acquisition of the perishables business of Panatlantic Logistics marks another important step in our global strategy,” Ruud said. Kuehne + Nagel ranks No. 11 on the Transport Topics Top 50 list of largest logistics companies in North America with net revenue of $1.4 billion in 2017. The company also ranks No. 2 on TT’s list of top airfreight forwarders, No. 1 on the list of top ocean freight forwarders and No. 15 on the list of top dry storage warehousing firms in North America.